It’s interesting what issues home-town papers latch onto. 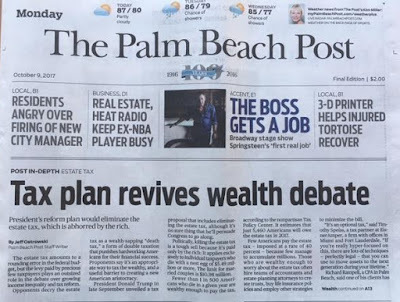 The headline of today’s Palm Beach Post chose to focus on Trump’s tax cut “plan. ” Write a blog such as this long enough and like a leitmotif in a novel the same issues seem to recycle. Here we go again, trickle-down economics in the form of tax cuts that will benefit, mostly, the rich and the uber–rich. I’ve touched upon economic inequality some two dozen times, including the impact of removing the so called “death tax,” notwithstanding Trump’s disingenuous “not good for me, believe me.” Removing this tax entirely encourages family dynasties, which in this competitive world leaves those who have to begin their journey at the starting line way behind. An argument that is made for removing the tax is it is a disincentive for working hard. Warren Buffett doesn’t think so and neither do the entrepreneurs of the world, people whose creativity and ideas drive their lives. Did Steve Jobs do what he did with the hope there would be no estate tax? The other argument is that some farmers who have vast land holdings upon death owe taxes on the appraised value. So, perhaps working farms should be exempt up to a certain amount. I explained my position in two articles in particular, both written more than six years ago. We are back to this prestidigitation again and as they are as valid as when they were written, I reprint them here. How rich is too rich? Actually, I published a book by that title almost twenty years ago and some of its ideas are as relevant today as it was then (How Rich Is Too Rich; Income and Wealth in America by Herbert Inhaber and Sidney Carroll: Praeger, 1992). Two points from that book stuck with me. First, there is the very descriptive opening chapter of looking at income distribution as an imaginary "sixty minute grand parade," tax payers being the marchers, grouped by their height which would be representative of their incomes, the first marchers having the lowest income and the last the highest, with "height" determined by the "average" taxable income being equal to the "average" height of an individual American. The "parade" in effect is an X/Y graph, the Y axis being the income (height), and the X axis being the minutes of the "parade." The first few minutes one sees no marchers even though we can hear some noise. These are people with negative height, those who report the loss of money in that taxable year. It isn't until about ten minutes into the parade that we see marchers between 10 and 24 inches in height and it isn't until 36 minutes we see the so called "average height" taxpayer march by. With about only 20 minutes left, heights begin to rise dramatically. With the last five minutes giants appear, people whose heads are so high we can hardly make out their faces without binoculars. The marchers in the very last minute of the parade are so tall we can only see their feet. These are people of accumulated, sometimes inherited, wealth and in the last few seconds the marchers are the size of sky scrapers. In effect, the parade shows a slowly rising gradient until the far right of the curve when it begins a parabolic rise and then shoots straight up off the graph. While the numbers might have changed over the last twenty years, the concept has not. Probably, if anything, the "parade" has become even more dramatic, more parabolic, with a steeper rise at the end. And, those at the end of the parade pay now less as a percentage of their income to the government than at any time before. To listen to the Tea Partiers, a roll back of taxes of the very wealthiest to pre-Bush rates, is an evil, evil thing. Just think of the trickle-down effect that would be lost to the little folk who stand in line for the crumbs falling from the tables of the fabulously wealthy. It is ironic that these dire warnings of the effects of a tax increase on the wealthy are carried into battle on banners hoisted by "Joe the Plumbers" -- it shows the power of the conservative media and the most virulent impact of the Internet. It just makes no sense that the people near the middle of the parade should become pawns for the people at the very end. Actually, I think the converse is true: it is an evil thing for people who have benefitted from being able to accumulate wealth in the greatest of all capitalist democracies, not to give back more for that opportunity. The argument goes that asking these people to pay more will remove the incentive for them to work, and maybe if we're talking about 70 percent of one's income that might be true. But in 2000, people reporting AGIs of more than $1 million paid 28% of their income as taxes vs. 23% five years later. In 2005 there were 304,000 households reporting income of more than $1 million, more than a trillion dollars of income or $3.375 million per household. And mind you of those, there are a few at the very end of the "parade" with incomes that have so many zeros they would be hard to read. The latter are sports stars, entertainers, and, of course, very, very successful entrepreneurs. Are they going to work "less hard" by paying an additional five percent overall? That five percent would mean another $50 billion going to the US Treasury, at least a beginning to address the ongoing deficit. And, of course, if you look at the $250,000 level as the cut off as suggested by President Obama, there is much more to be gleaned, but given the midterm elections, that level is probably going to be raised if it is not eliminated altogether. The alternatives that are occasionally pushed by the Tea crowd, such as a flat tax, is, in effect, a regressive tax, with the lower income people having to pay the same taxes on necessities as the wealthy, which just further splits the great economic divide in this country. A national sales tax does the same thing and as we are now so dependent on consumer spending, that could be the death knell for the economy. No, a progressive tax structure has been this country's basis for supporting it's national programs and we have been able to grow in spite of these supposed "disincentives" of higher taxes at a higher bracket. No doubt the current tax structure is hopelessly and needlessly complicated and THAT is where the discussion should also be focused. There are so many loopholes, that a revised graduated tax structure would not have much teeth without addressing those as well. And then there is the issue of capital gains and dividends. We certainly want to encourage taxpayers to reinvest in our equity markets. The other point I never forgot from that book was its commentary on the estate tax, arguing against the estate tax altogether, provided there was an alternative system of "estate dispersion." Rather than taxing one's estate at death, it suggested a tax-free dispersement up to a certain level per recipient (rather than per estate). For argument's sake, call that $1 million per recipient. Amounts exceeding that would begin to be taxed on some kind of graduated basis. Those would be life time totals, so if an individual receives money from different inheritances, they would be accumulated and taxed on that scale. "No longer would the estate tax system generate an American royalty -- those freed from the need ever to be economically productive. This alternative system would generate for all the incentive that most of us have in the outcome of our own economic lives. No longer would a large part of our national wealth be beyond responsive use." Now, the incredibly wealthy could give a million dollars each to a thousand different people, all tax free (if those recipients also received no other inheritances in their lifetimes). The point is that those thousand people would put that capital to work, rather than vesting a billion dollars in one's immediate family who might decide to simply live off the income and pass it on to the next generation, and the next. Or he/she could still leave more to the immediate family, but it would be subject to taxation, perhaps substantial taxation on a graduated basis. "Wealth great enough to entitle one to membership in the elite comes from two sources -- enormous earnings or inheritance. Prudent public policy should allow those, who, through individual ingenuity, talent, or luck, gain a fortune to use and enjoy it for life...but if these individuals have the power to transmit immense wealth to others after death...they can write the rules controlling this wealth, possibly many generations into the future. This breaks the chain of personal effort that is tightly bound, for most of us, to personal reward. Economic resources, controlled by rules set up by the dead, are denied to those who might well be more productive." If the Republicans and Tea Partiers interpret their gains to mean they now have carte blanche to keep the Bush tax cuts for the highest wealth tier -- people who would not be hurt by some roll back to pre-Bush tax levels -- the result will only increase the deficit further. There would seem to be no upside to such an action; in effect it is a spending initiative something they claim to condemn. Failure to make tax reforms that lead to a more graduated income tax and closing loopholes, and not having a sensible inheritance tax also just further drives a stake between the haves and the have-nots. About a year ago I likened the US income distribution to a "parade," the wealthiest appearing only at the very end, demonstrating the parabolic nature of great wealth at the very extreme of the income curve. I was wondering when, finally, the middle class would wake up to this growing disparity and do something about it. Finally, the "Occupation of Wall Street" movement takes up the cause, hopefully all by non violent means. At the time I said "to listen to the Tea Partiers, a roll back of taxes of the very wealthiest to pre-Bush rates, is an evil, evil thing. Just think of the trickle-down effect that would be lost to the little folk who stand in line for the crumbs falling from the tables of the fabulously wealthy. It is ironic that these dire warnings of the effects of a tax increase on the wealthy are carried into battle on banners hoisted by 'Joe the Plumbers' -- it shows the power of the conservative media and the most virulent impact of the Internet. It just makes no sense that the people near the middle of the parade should become pawns for the people at the very end." It is sad that Steve Jobs should pass away at this time. I think of him not only as a visionary technology and marketing genius, but as the greatest entrepreneur the world has ever known. The grass root movements of today, such as Occupation of Wall Street, would not be possible without the mobile devices he had a key part in developing and popularizing. I feel a personal loss of his passing at such an early age, and of the same terrible disease that took my father. And I wonder, if we did have a fairer graduated tax structure, one that would have rolled back the Bush tax cuts, would he have worked any less hard? The "don't-tax-the-job-creator" crowd might so argue. Steve Jobs worked as he did because it was his passion. Entrepreneurs work with a creative obsession that is not going to be railroaded by a higher incremental tax rate. They are the job creators, not the legions of corporate and banking types, raking it in, paying a lesser portion of their income in taxes than a dozen years ago when the US actually had a balanced budget, CEOs now being paid unspeakable multiples of the average income of workers in the same company. Are higher incremental tax rates and the closing of loopholes the only solutions to the deficit? No, but it's a beginning. And that, as well holding these people accountable for any fiscal malfeasance, is what the growing Occupation movement is all about, the middle class finally awakening to the issue of their being used as puppets by political ideologists.